Peeps, I am tired! I went for a 25 mile bike ride today, which isn’t actually very far, except that I was with a bunch of scouts trying to earn a cycling merit badge and they ride really s l o w. So the ride took a heck of a lot longer than it would have if I was just on my own. I don’t know exactly why, but cycling for a long time at a slow pace is much more tiring for me than riding the same distance in a shorter period of time. Physics. It’s probably physics. or biology. or something. Also, I watched Avatar for the first time today, so now I understand all the Pocahontas jokes everyone has been making for the past year. I am considering asking to be released from my calling, and I thought I’d see what sort of reaction my readers might have. Generally, I think asking to be released from a calling is perfectly ok. I don’t necessarily believe anyone received divine inspiration to give my my current calling, and I don’t necessarily think God cares if I continue in my calling or not. But in the spirit of pragmatism, my personal belief that having a calling that challenges me is a good thing, and the frank reality that someone has to fill some positions they don’t really like or else nobody would do anything, I don’t take asking to be released lightly. Ultimately, I believe that asking to be released is an act of selfishness – it’s putting your own needs/desires/wants ahead of those of the community. But I also believe there are some really excellent reasons and situations when selfishness is necessary and should be encouraged. The trick is recognizing those situations. I’m currently serving as 11-year-old co-scoutmaster and have been serving in this capacity for one year. Because there are relatively few youth in my urban mpls wards, our scout program has been combined with two other wards, and our meetings have been held at the stake center, about an 11 mile bike ride from my home. I have always been annoyed that I had to travel so far via bike each Wednesday evening for meetings while my own meeting house 2 miles from home sat empty, but it wasn’t really a big deal since the stake center just happened to be in the same direction as my office where I was cycling every wednesday anyway. The whole round trip (home-work-scouts-home) was only about 5 miles further than my typical daily ride (home-work-home). In addition, the high-quality bike trail network in that direction is well-developed so it was actually a very enjoyable ride each week. But the stake boundaries have just changed and the wards we were previously combined with are now in a different stake. Our stake and ward leadership have made it clear that combining with these wards is no longer an option and is arranging to have our scout program combined with another ward in the stake. I anticipate that the arrangement will be for us to meet with a new ward at their building (mine will remain empty each Wednesday), which is about 12 miles from home in the opposite direction – the suburban hell direction with no bike paths or lanes, high-traffic 6-lane arterial roadways, shopping malls, and general bicycle unfriendliness. Here’s the key – I can handle the bike ride. 12 miles isn’t that far and I’m an experienced cyclist prepared to kick the tail lights out off any vehicle that passes too closely. My wife and I even own one of them new-fangled automobiles that I could use if I wanted. But I don’t want to. I chose to locate myself in south mpls because I like being near things, including the ward meeting house 2 miles from home. I chose to locate my employment near a major regional bike trail because I desire to contain the majority of my daily/weekly tasks within an area that is easy for me to get to via bicycle. Plain and simple: I’m thinking about asking to be released just because I don’t like the new meeting location because it would require an unpleasant bike ride each week. And the idea that I might be traveling to a chapel 12 miles away when there’s one 2 miles away drives me nuts. This strikes me as the ultimate selfish reason to bow out of a calling. I am perfectly capable and willing to perform all the tasks the calling requires, I’m just committed to an idealistic world view (and an unrealistic world view given the spatial arrangement of American metropolitan areas) where people shouldn’t drive great distances to reach things – especially if that same task can be performed closer to home. I even recognize that the only realistic alternative to combining our youth program with another ward is to not have a youth program at all – which is certainly a poor option. Either they travel a long distance to my building so I can travel a short distance, or I travel a long distance to their building so they can travel a short distance – or we don’t combine (not my decision to make). Or I quit and the bishop assigns someone else to travel a long distance so I don’t have to. With my world view and the great distances between mormons in mpls, this is a Lose-Lose-Lose situation. Author Posted on May 11, 2009 Tags Mormon / LDS, scouts16 Comments on Quitting: too selfish? She doesn’t understand Scouting at all…. Last night I sent a letter to the bishop. No, it wasn’t one of THOSE letters… It was a letter requesting a new bicycle rack for the Nicollet Ave chapel. A simple email probably would have sufficed, but I felt that a more formal proposal would be more effective. Melanie says she thinks it will be effective, but possibly only at getting me a new calling with more responsibility. To be certain, I am straying far from my usual “under the radar” strategy of church involvement. I’m not too worried, though. 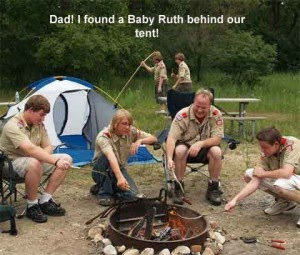 They can try all they want – I ain’t leaving 11 year-old scouts (unless I get promoted to 12 year-old scouts…). But the Bishop was quite receptive to the idea of purchasing a new bike rack and referred to my proposal as a “stellar analysis.” He has asked that I work up some numbers regarding the demand for bicycle parking at the chapel from the two wards and one branch that meet there. Turns out, that’s what I do all day at work – estimating travel demand given various investment scenarios. So I’ll get some numbers together, perhaps a list of names of those who would like to see improved bicycle infrastructure at the chapel, and we’ll go from there. It is sure to be a long process, but that’s probably ok since we’re coming up on winter. My goal is to have a new bike rack in place by next spring. A few weeks ago, my wife and I were out enjoying a beautiful Minnesota summer Sunday afternoon. After church, we hurried home, grabbed a quick bite to eat, and were back outdoors. 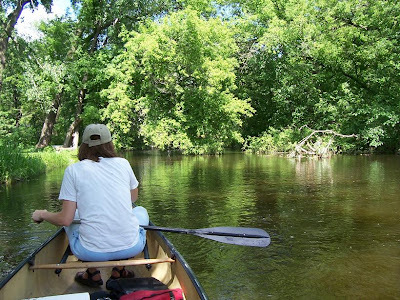 On this particular afternoon, we decided to canoe Minnehaha Creek. 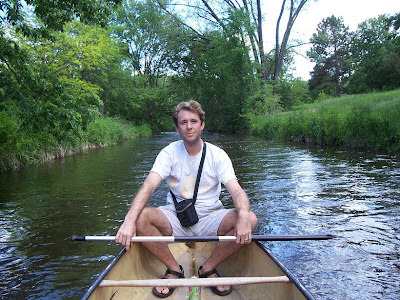 We were excited to canoe this particular creek because it is close to our South Minneapolis home and because we enjoy the homes along the waters edge and because the creek is surrounded by urban Minneapolis. Along the more suburban sections of the creek, most of the homes are facing away from the creek resulting in their backyards being immediately adjacent to the creek. Much of the creek flows fairly quickly and there are plenty of fallen tree branches and other obstacles along the way that we didn’t have much time to enjoy the scenery, but one section was either moving more slowly or else there were fewer obstacles to miss, so we found ourselves admiring the homes, and the large backyards adjacent to the creek. “Aren’t those the Bishop’s kids?” I said to my wife. As we floated down the creek, I watched the two children play on the trampoline for a brief moment. I was struck by how well the two seemed to get along. The older son wasn’t attempting to push the younger girl off the trampoline as I probably would have been at his age. The age difference between the two didn’t seem to matter. Him, around age 13, her around age 7. I was positive. I had recently participated in a Scout Committee Meeting where the young man had presented his plans for his upcoming Eagle Scout Project and I had been impressed by his conduct, his reverence, & his courtesy – truly a young man who lived up to the Scout Law. His younger sister is unmistakable. She’s a cheerful & shy girl with a beautiful smile. My only interaction with her was once across the street from the stake center. My 11 year-old scouts were playing nearby when she wandered up to the piece of playground equipment I was leaning against and told me about one of her favorite toys. “Yes. That’s definately them.” I said. I thought about waving, or shouting hello, but the creek was moving quickly and the opportunity was already slipping past as we floated downstream. As we floated out of sight, I thought of the connection I feel with other members of the ward family. I consider them part of my family, and I hope they consider me part of theirs. I’m grateful that the Church allows me the opportunity to meet members of the younger generation that I otherwise wouldn’t know. “Uh oh! Do you think they’re gonna tell the Bishop they saw us canoeing on Sunday?” my wife asked jokingly. 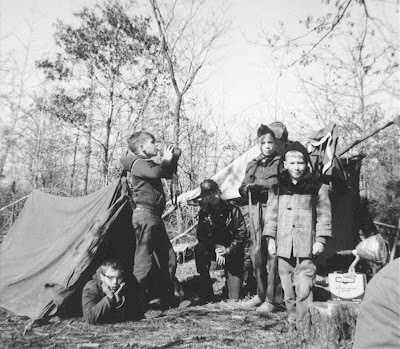 In my Minneapolis Ward, there are barely enough children to have a Scouting program. In fact, our 11 year-old scout patrol is combined with a neighboring ward – and we still only have three boys enrolled in the patrol. Last night, only one was present – and he arrived 15 minutes late, right as the other scoutmaster and I were getting ready to leave. We began scouts by reciting the scout oath and law, and by demonstrating the scout handshake and salute, but quickly realized that our lone scout for the evening (who has Down Syndrome)simply didn’t have the attention span to continue with official scout business this evening. So we went outside and threw a frisbee around for a while. Soon, though, our lone scouter told us that he didn’t want to play frisbee anymore – he wanted to play baseball. We tried to convince him that we couldn’t play baseball because we didn’t have any mitts, baseballs, or bats, but he wouldn’t be convinced. So we played baseball. For the next few minutes, we threw an imaginary baseball to eachother. The other scoutmaster pretended to pitch, I pretended to catch and be the umpire, and our scouter lined up to the plate. Each time a ball was pitched I called either “ball”, “strike”, or “foul ball,” and the scout would try to convince me I was wrong. But on the next pitch I called, “HIT! RUN! RUN! RUN!” So he ran, grinning ear to ear. I chased him around the bases, also grinning, and told him that if I caught up to him he was out. I couldn’t catch him. So as I chased him around the bases, halfway through my first game of imaginary baseball, realized how grateful I am that the LDS church allows me to be a part of this scouter’s life, and how grateful I am that he’s part of mine. I hoped that this scout would fondly remember the time he spent as a scout – just like I fondly remember the scout activities I participated in when I was his age. I thought of some of the wonderful scoutmasters and YM leaders that had had an impact on me growing up, and I hoped I was living up to the example they set. I’m grateful for that game of imaginary baseball with an 11 year-old scout, I’m grateful for the game of “frisbee four-square” that followed, and I’m grateful to be a part of the LDS church. Melanie and I failed to complete an adventure together this weekend. Sorry to disappoint. We were busy the whole weekend, though, just nothing seemed to qualify as an adventure. I left town friday evening with the 11 year-old scouts for a campout in Sand Dunes State Forest where we had fun eating hot dogs, discussing pokemon, geocaching, and general tom-foolery. After we got home on saturday, we went with b+k to the Guthrie Theater to see A Midsummer Night’s Dream at the Guthrie Theater. It was a lot of fun, though some parts were completely over-the-top. It was an interesting production – very contemporary. Some parts of the text were sung to music and there was plenty of flying (dangling from wires from the ceiling), and the director seems to have a thing for actors and actresses ending up in their underwear onstage. Overall, it was good, clean fun – but according to Mel, not an adventure. We spent Sunday afternoon repairing our garage door opener, riding our scooter around town, walking around Lake Calhoun, and going to the movie theater. All fun – but not adventures. Sorry to disappoint. We’ll begin right now to plan our adventure for next weekend. 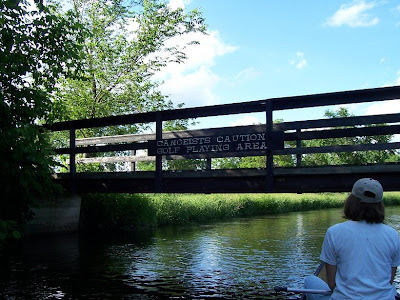 Our second adventure for this past weekend was a canoeing trip down Minnehaha Creek. Minnehaha Creek is a very urban stream that runs right through the heart of South Minneapolis. It’s by far the smallest stream Mel and I have ever canoed. Because it’s so small and the current is faster than many rivers in Minnesota, we expected it to be really easy. We were wrong, though. There were so many tree branches hanging down into the water that it was really difficult to avoid them all – especially with the current pushing you along pretty quickly. So we ended up with a few scratches from hanging tree limbs and such. But it was still a lot of fun. We started in Edina in Pamela Park and finished in Lake Hiawatha in Minneapolis. The trickiest part of our adventure, though, was the logistics of taking ourselves camping. Here’s how it worked. We loaded up the bicycles and the canoe on our car and drove to Lake Hiawatha. We left the bikes there and drove about 5 miles up-stream to Pamela Park. We levt the car there and canoed back down to our bicycles at Lake Hiawatha. There, we chained our canoe to a tree and rode the bikes back upstream to the car. 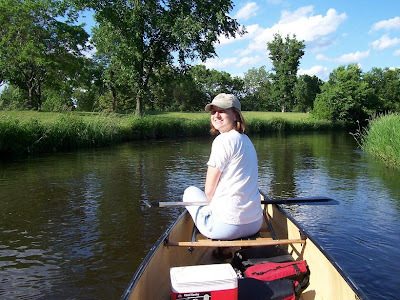 Finally, we drove back to Lake Hiawatha, picked up the canoe, and came home. Since the creek is in the middle of a very urban area, there were a lot of bridges to go under. Some of them were extremely low. On half-a-dozen locations, there was only a foot or two of clearance space between the top of the canoe and the bottom of the bridge. We had to lean back as far as we could and lay flat against the top of the canoe to fit under the bridges. Another hazard: golfers. Up next week: it will be hard to have an adventure this weekend since I’ll be out camping with the 11 year-old scouts friday night (NOTE: while that may be an adventure of it’s own, since Mel isn’t there, it doesn’t count).